Food Blogga: Forget Mother's Day Brunch. Just Make Mom Mascarpone, Nutella, and Fresh Berry Toasts. Forget Mother's Day Brunch. 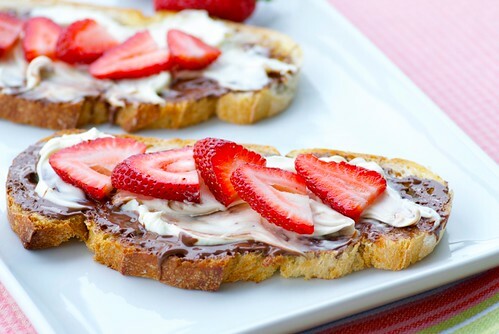 Just Make Mom Mascarpone, Nutella, and Fresh Berry Toasts. Mother's Day is this Sunday, which means you're either taking Mom out for brunch or making her brunch at home. Last year I provided a week's worth of recipes for Mother's Day brunch and had planned on doing the same this year. I have decided against it. Instead, I'm going to provide you with one recipe, one sublimely simple yet decadent recipe, for Mascarpone, Nutella, and Fresh Berry Toasts. 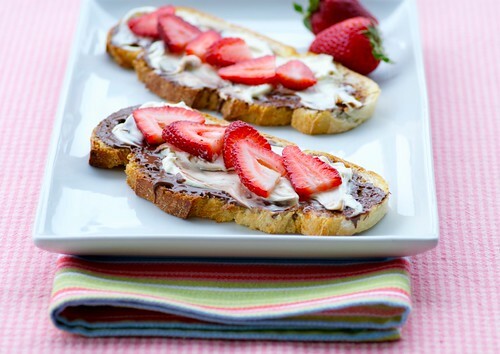 Crunchy Italian toast is slathered with creamy Nutella and rich mascarpone cheese then topped with sweet, sliced fresh strawberries. When I posted on Facebook that I was creating Mother's Day brunch recipes and that one included Nutella and mascarpone, my dear friend Kate of Kate in the Kitchen, replied, "Well, what else do you need???" Exactly. So if you want to become Mom's favorite child (even if only for a day) make her these Mascarpone, Nutella, and Fresh Berry Toasts. You really don't need measurements for this recipe. An (8-ounce) tub of mascarpone cheese and 2 pints of berries should make about a dozen toasts. 1. Lightly butter bread and toast until golden. 2. Smear on a layer of Nutella, then top with a Layer of mascarpone. Arrange fresh berries on top. Serve immediately. Await praise. I am not a mother (yet), but I am going to eat these. Maybe today. Maybe I'll be nice and save some of the ingredients for my own mom on Sunday. I don't think I can wait until then. Oooh, decadent enough to eat two but sliced thin enough to avoid the guilt. Here's to all moms! Yuuuummm...I'm actually making dinner for Mom, but there's no reason I can't enjoy these myself. Right? :-) I mean, I need to keep my strength up for all the cooking I'll be doing. Rationalization is a beautiful thing. Thanks for your comment on MY Nutella recipe (ice cream sandwiches) over at Our Krazy Kitchen - I love your blog and seeing that you took the time to comment on my post really made my day! I'll take two - one for each of my kids.PS - I couldn't find you on FB? What's your fb name? Now THAT'S what I call a Mother's Day recipe. Simple, pretty, feminine, and easily executed by (my) kids. Plus, you've got your chocolate group, your dairy group, and your fruit group. It's practically a multivitamin! peter-That's the way to look at it. mrsjenb-Absolutely! It's got protein, carbs, and fiber for all day fuel. ;) And you're so welcome. It was my pleasure. ciaochowlinda-I'm Susan Russo on FB. Thanks! rambling-Dinner? Aren't you sweet. You should definitely reward yourself with one of these babies then. Looks like a fabulous way to celebrate Mother's Day...or any day! This recipe is all I need to see! I won't be having brunch with my mother, but I think this would make a nice dessert don't you? That looks spiffy! Last year I discovered the joy of strawberries and goat cheese. But then, there's Nutella! Will Mom ever be the same? Susan that is a perfect breakfast. My problem is that if I had that breakfast I would become addicted to it and want it everyday!!! Oh yum! So often, it's the simple recipes that are the very best! I think this one qualifies! Now this would be gilding the lily, but what about a small dessert version, maybe small shortbread cookies instead of the toast, with just one slice of strawberry! How fun to 'riff' on your happy-mama idea! Mmmm! Something simple, sweet, and beautiful. Mom could not ask for anything more! I sent this recipe to my Mom, she loves Nutella. I am merely a good child, not a favorite child. Ooo. I do like the look of this. Have emailed to my foodie son, just a gentle hint re what mama might like (to share, natch) on Sunday morning. Thanks for serving up something pretty and possible for a young one to put together without stress! This is exactly what I want for mother's day breakfast! Looks super decadent! What a great & unique easy idea!! MMMMMM,...I have allready cooked & baked a lot of your tasty dishes & I think you have a COOL foodblog! OMG - forget Mom, I'm making that just for me!!! Nutella and mascarpone are two of my favorite things. I think if I made something like this, I would just eat slice after slice of toast until I ran out of bread! I'm just taking Mom out to dinner at her favorite local restaurant the night before Mother's Day. Fewer crowds that way. So simple, so yummy! My mother would love these... and so few dishes to clean up after! Perfect! That would sure have won my mom's heart! Make it simple and it seems totally over the top elegant. A winner for sure Susan. If my family made me that for Mother's Day I would be very, very happy! Yes Please! Something the hubby and the kids can easily do. I hope I get to eat this every day! You definitely have this one figured out---as a mom I know I would love to see a few of these finding their way to the table on Mother's Day! ---or any day, for that matter. Berries and mascarpone are a killer combo. Fit for mother's day =) I'm going to make this one before the day ends. I'm drooling. I have strawberries in the fridge and homemade "Nutella" that needs to be finished up. I think I know what we're having for dessert tonight! Love the ease of this recipe. It would be perfect on a brunch menu -- delicious decadent ingredients prepared with simplicity! Cheers to all the mamas!! debbie-There's a strong likelihood that could happen. teachercooks-I'm glad you think so. grumpynhoney-I hope you got it! katie-That's true. An unexpected bonus! tanna-I'm sure you would love to opportunity for another Mother's Day with her. Thank you so much! michelle-I hope you licked the spoon! lisa-Cheers! Cheers! Mamas are the best! Good work. Your post Make money, Home Business is an excellent example of why i keep coming back to read your excellent quality content which is forever updated. Beautiful summer sandwich idea Susan, I will feature this recipe as "This week featured article" on my side bar (just a link to your post) if you don't mind.